Self-esteem. It is something we’ve always wanted our children to have, and some of us wished they had. But building self-esteem has always been a huge challenge, a constant battle. While believing in yourself is the hallmark of self-esteem, it isn’t just what it’s all about. Scientists are still learning about self-esteem, as much as we are. And below are some of the significant insights they’ve learned about it. Self-esteem comes in different types. If you feel good about yourself and do not consider what other people would feel, it’s called self-centered self-esteem. If you are more about considering other people’s emotions but have low self-regard, you have anxious self-esteem. If you don’t feel good about yourself, and at the same time don’t do good deeds for others, you could be having depressed self-esteem. The best kind of self-esteem, which is genuine self-esteem, is when you feel good both about yourself and your actions. It isn’t just about feeling good. Having a high self-esteem does not only mean feeling good about yourself. It also about doing good things. The good deeds you do promote positive feelings, which in turn strengthen your self-esteem. It isn’t just about trying. It’s more on doing. Every day, we try hard to be better. We try hard to improve ourselves – be smarter, faster, healthier, leaner, and be so much better than what we were yesterday. But there’s one big problem with trying, when it comes to self-esteem. That’s because what self-esteem needs is completion. There’s a fine line between knowing that you accomplished something and wondering if you could have. While pursuing a goal can be tougher than simply trying, it is better for your self-esteem. You may fail at some points, but you will find that these failures are going to give you plenty of life lessons that will all help you hone a better version of yourself. Most damage to self-esteem are caused by no one but ourselves. 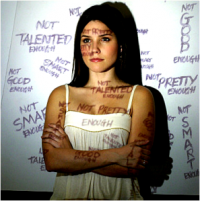 Unfortunately, much of the things that pull down our self-esteem are but self-inflicted. For instance, being too self-critical, focusing on our imperfections rather than strengths, and kicking ourselves out when we are already down, are things we sometimes do, than hurt our self-esteem. Self-esteem is not just about the ‘self’. Whilst the term ‘self-esteem’ is suggestive of having high regard with oneself, the focus is not only about ourselves. It also involves our actions and responses to other people and situations you go through in life. Our self-esteem fluctuates from time to time. Much like a bad hair day, you might wake up one day feeling down and lacking in self-confidence, and wake up the next day feeling that you can do move a mountain. But by practicing more optimism and keeping your mental and emotional health in check, you can have more sunshine than rain. Physical attractiveness does not guarantee self-esteem. Many people believe that having nice looks promote self-esteem. This is probably why most of us would spend a fortune, undergo risky surgeries and treatments, and do anything to invest on beauty. But studies have found that people with low self-esteem were judged to be just as attractive by others as people with high self-esteem. What matters more is how we present ourselves. So a person who dresses well and feels good about him/herself has higher self-esteem than someone who dresses less attractively and is insecure and unconfident. A high self-esteem gives us immunity from emotional turmoil. People with high levels of self-esteem are less affected by stress and anxiety, and are less likely to be bothered by the negative things and situations they encounter in life. And even when they do, they recover from these setbacks more quickly. ©Copyright 2013 by http://www.naturaltherapyforall.co m Counselling Sheffield All Rights Reserved.